For Kin Lui, the realization came from a newspaper article. The Hong Kong-born, Hawaii-raised sushi chef was taking a rare break during a shift at a Japanese restaurant in San Francisco when he read a piece about the rapid decline of the bluefin tuna  perhaps sushi lovers' favorite item. As Lui finished the article, he was called back to the kitchen: there was a big order of maguro, the delicate belly meat of the bluefin tuna. That was when Lui, 29, made the connection between the steady disappearance of fish from the ocean and the meals that he had spent a career preparing. Sushi has grown from a working-class food in Japan to a globe-spanning industry  enough that in the U.S. alone, 225 million restaurant meals served last year included sushi, 11% more than the year before. To meet the ravenous hunger for maguro or hamachi (yellowfin tuna), fishermen are fast emptying the seas. According to the Monterey Bay Aquarium, the population of species like wild bluefin tuna has fallen by nearly 90% in 30 years. Sushi chefs  and devotees  have to face the fact that our grandchildren's idea of sushi might be jellyfish on rice. Lui and his partner Raymond Ho  another Hong Kong-born sushi chef who had kicked around San Francisco  looked for another way, deciding on a sushi restaurant that would be truly sustainable. At the same time, Casson Trenor  an environmentalist then working with the Santa Cruz-based green group Fishwise  was fighting to make fishing less destructive, and researching a book on sustainable sushi. When Trenor met Lui and Ho in November 2007, he took a red pen to a typical menu and started crossing off items that were unsustainable. "I knocked off the best-selling items: farmed shrimp, farmed salmon, hamachi, long-lined tuna," Trenor says now. "That scares the hell out of most sushi chefs. But they just said, 'Yes, we can do that.' That's when I knew these guys were serious." 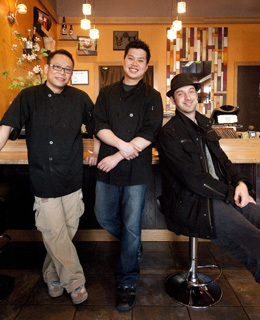 A few months later, Lui and Ho  with Trenor as a consultant  opened Tataki, America's first sustainable sushi restaurant. The menu at the 24-seat San Francisco restaurant is screened for its impact on the oceans. Instead of ubiquitous shrimp or farmed salmon, you'll be served substitutes like wild Arctic char, which has the taste and feel of salmon yet is far more plentiful, or sardines, a fish low enough on the food chain to be sustainable. The restaurant is a hit; lines of waiting diners can be seen stretching out the door on Friday and Saturday nights. The sustainable spirit is spreading as well  Trenor just helped open a restaurant in Seattle that abides by Tataki's values. As Lui, Ho and Trenor show, for sushi lovers, the first step to saving the oceans is to think about what goes onto your plate  and into your stomach.